This publications is freely available to all registered users of this site. Shutdowns, outages and turnarounds (SOTs) of major accident hazard (MAH) sites are challenging. The SOT requires a lot of disparate repair and upgrade work to be done in a short period of time, usually carried out by specialist contractor staff. This publication aims to identify pertinent areas where HF plays a role in the success or failure of a SOT programme. 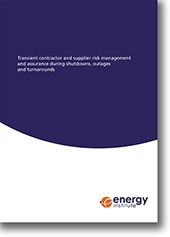 It is structured around a select number of issues, with an explanation of the HF issue and, wherever possible, guidance, checklists and case studies demonstrate how this issue can be addressed. The guidance provided is of relevance to SOT projects, as well as shorter projects lasting from a few days to a few weeks in length. specific to SOTs: examples include tools, spare parts and consumables. Issues related to these are often underrepresented in guidance on major hazard safety; however, some very significant incidents have occurred when spare parts, stores or equipment have not been managed carefully. This publication is intended to be used by anyone who can make use of the guidance given. Some issues will require a significant degree of HF specialism, others can be addressed by anyone familiar with work on a major hazard site. It is not necessary to read this whole publication cover-to-cover. It is intended to be used like a toolkit, making use of relevant sections and guidance when needed.